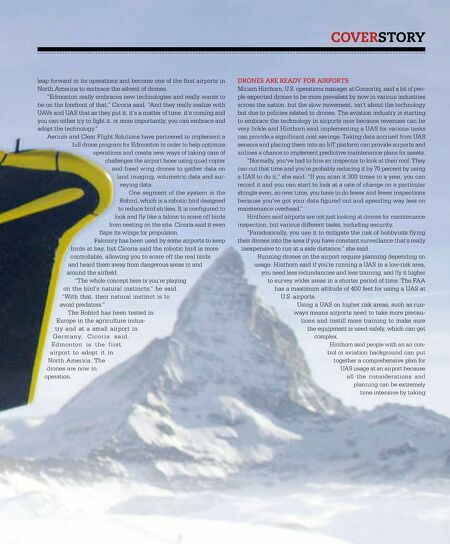 COVER STORY By Joe Petrie Drones have officially made it into airport operations and are poised to upend how the industry tackles maintenance. In October 2016, Cicoria — who is man- aging director of Aerium Analytics — said the company was in Japan for an aerospace show as part of an Alberta delegation, when they struck up a conversation with represen- tatives from Edmonton International Airport (EIA) about unmanned aerial vehicles (UAVs), who were also part of the envoy. EIA was showcasing the Alberta Aerospace and Technology Centre and Aerium was show- casing its drone technology. 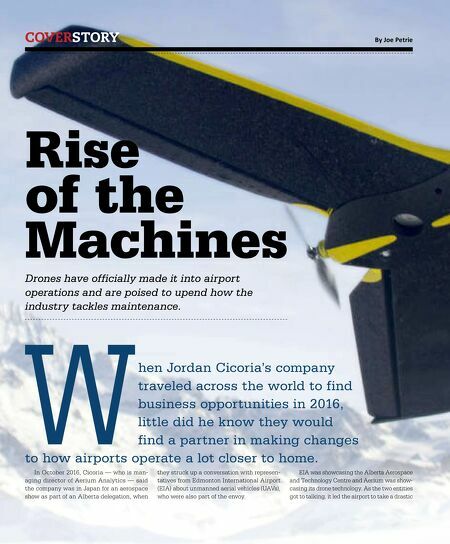 As the two entities got to talking, it led the airport to take a drastic Rise of the Machines W hen Jordan Cicoria's company traveled across the world to find business opportunities in 2016, little did he know they would find a partner in making changes to how airports operate a lot closer to home.